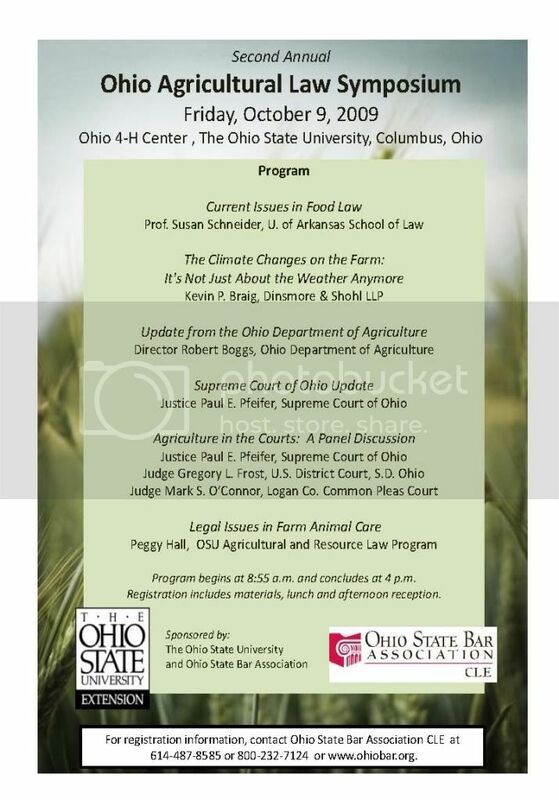 OSU will host the second annual Ohio Agricultural Law Symposium on Friday, October 9, 2009. 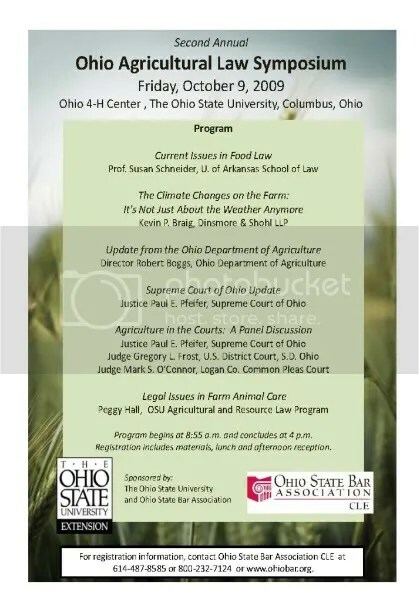 This legal education event is a partnership between OSU and the Ohio State Bar Association, and will provide updates, analysis, interaction and discussion for attorneys with agricultural interests. Speakers such as Ohio Supreme Court Justice Paul Pfeifer, Ohio Dept. of Agriculture Director Robert Boggs, and Prof. Susan Schneider from the U. of Arkansas Graduate Program in Agricultural Law. Topics such as current issues in food law, climate change legislation and agriculture, farm animal welfare laws and agriculture in the courts. Entry filed under: farm management. Tags: ag law symposium, agricultural law, agriculture law, peggy kirk hall. This blog is no longer being maintained. Information on this blog may still be relevant, but for the latest agronomic information and farm management information please visit http://corn.osu.edu and http://ohioagmanager.osu.edu, respectively.